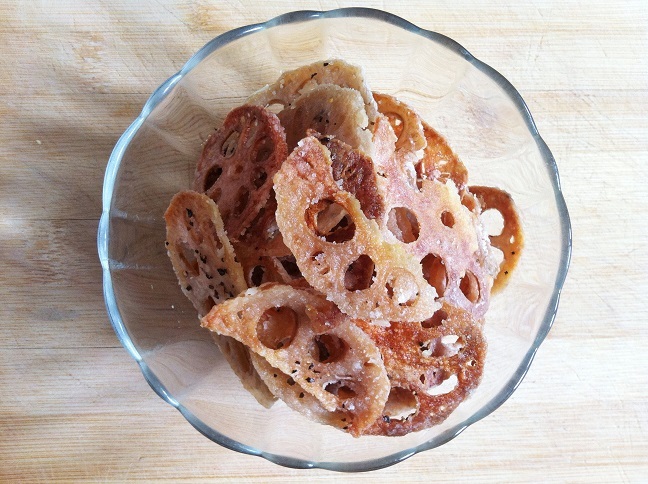 So after figuring out how I could make these lotus root chips crispy, a recipe formed and ta da. 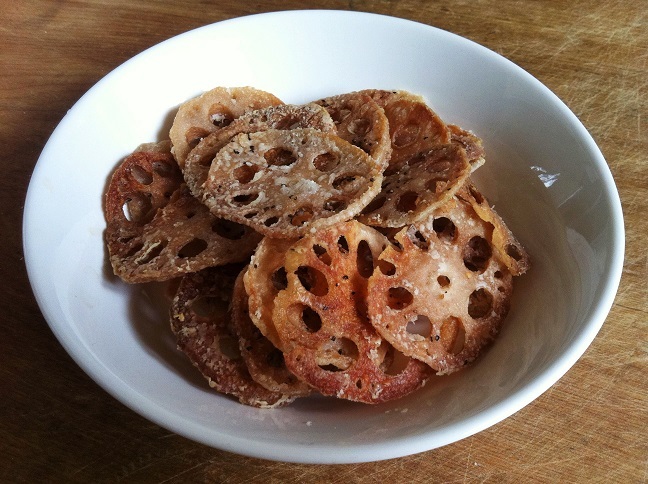 We now have lotus root chips. Have you ever had lotus roots before? I actually haven’t seen them anywhere other than at an Asian supermarket or restaurant. They look exactly how you probably think they look, like a root. With lots of holes in the middle. Lotus roots are crunchy in general. When they’re sliced and cooked in soup, there’s a crunch with every bite. 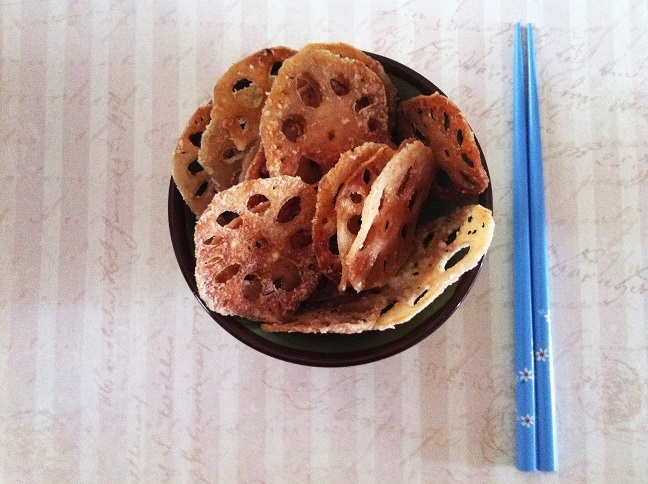 Filled with lots of vitamins, minerals, and fiber, the lotus root is very healthy. Even better? It’s low in calories and fat content. Doesn’t that sound perfect? It certainly does to me. That means another guilt free snack. Yay! 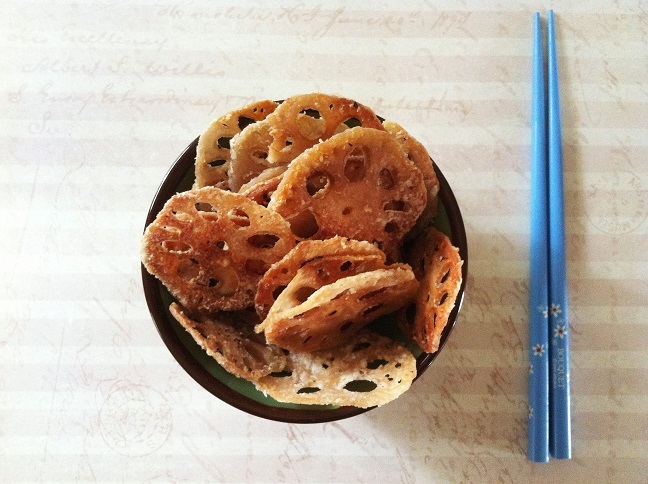 If you’re not sure whether you’ll like lotus root, buy a small one. They come in many different sizes. Make them into chips by following my recipe and try it to see if you like it. It takes about 20-30 minutes for you to get crispy chips. Worth a try, isn’t it? Especially for a guilt free snack? Did I mention they’re gluten-free and vegan too? First, preheat the oven to 350oF. Line a baking sheet with foil and coat with nonstick cooking spray. 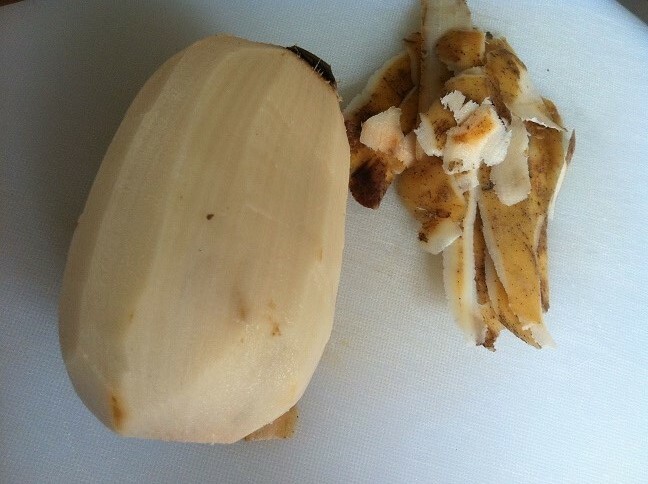 While the oven is heating, peel the skin from the lotus root, and cut them into thin even slices. You want the slices to be as even as possible. Otherwise, the chips will be ready at different times. 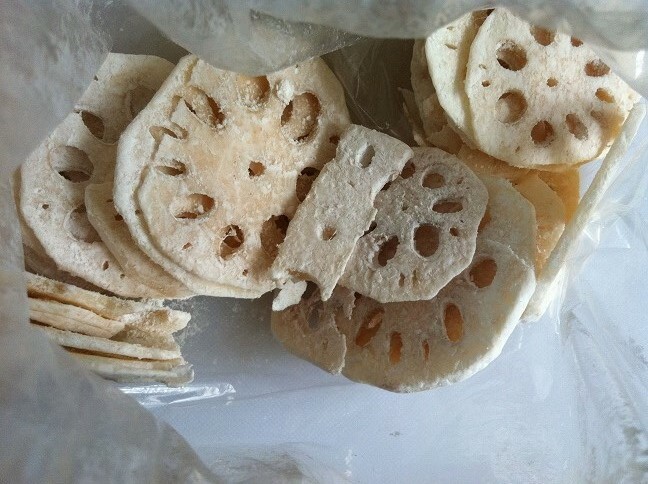 Place the lotus root slices into a Ziploc bag or a plastic bag. Add in cornstarch and toss until the lotus roots are evenly coated. 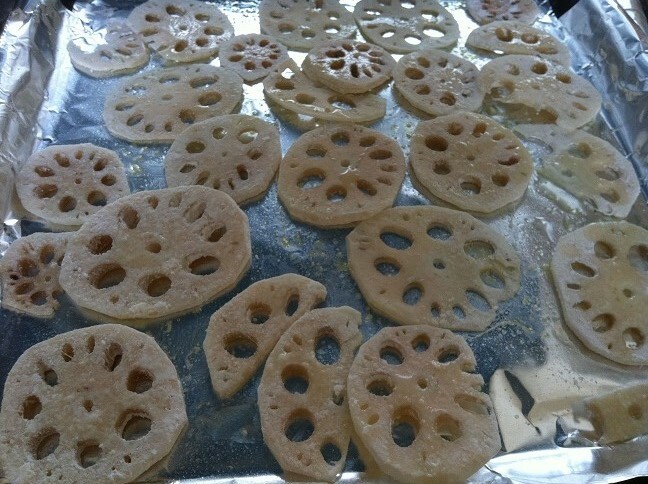 Place the lotus root slices onto the baking sheet in a single layer. Don’t place them on top of each other. Otherwise, the chips will be less crispy. 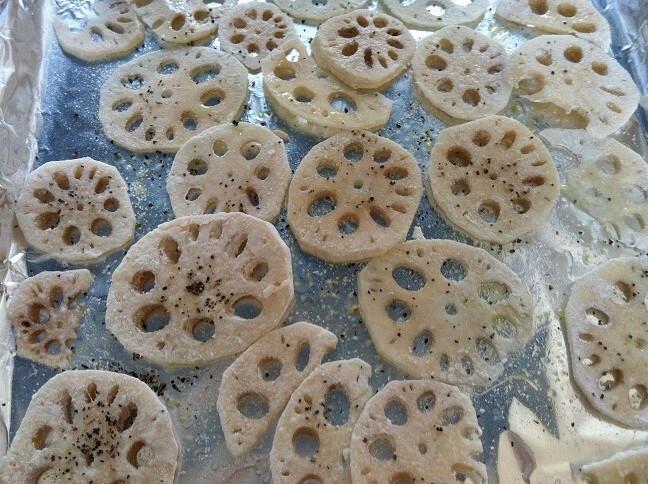 Drizzle olive oil over the lotus root slices as evenly as possible. Sprinkle salt and pepper over the slices. Allow the lotus roots to bake for about 8-10 minutes before flipping the lotus roots over. Bake for an additional 5-10 minutes until the chips turn a golden brown. If your chips were cut unevenly, they will be ready at different times so make sure to remove the ones that are ready first to prevent them from burning. 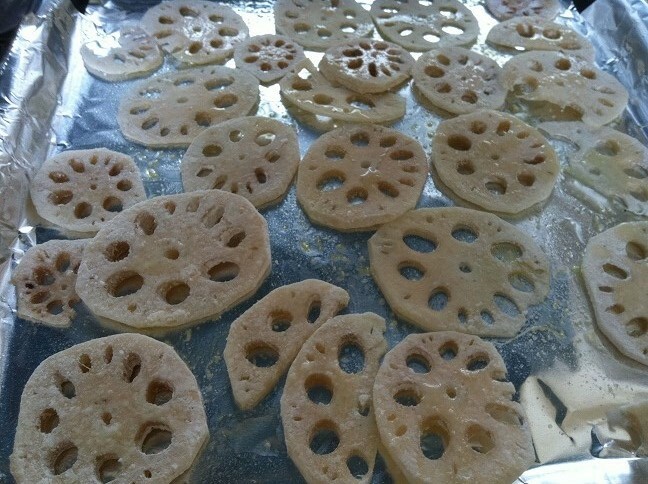 Remove the lotus root chips from the oven and allow it to cool for several minutes. If the lotus root chips are a little soft, don’t worry. Once they cool, they will become crispier. 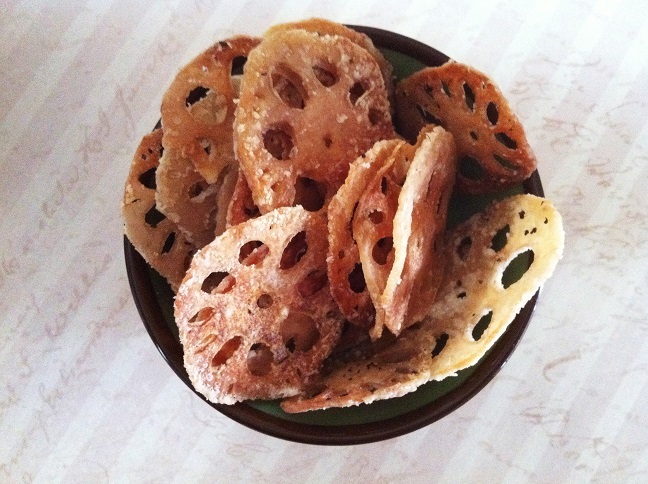 Once the lotus root chips have cooled, serve them in a bowl or a plate. It’s important to eat them the same day. If not, they will lose their crispiness. Enjoy! I had these in China. Could not believe how good they are! I must try these. I have several friends who would enjoy them also! Yummy! I love Shanghai dumplings and dim sum but it is almost impossible to find either in south Texas. 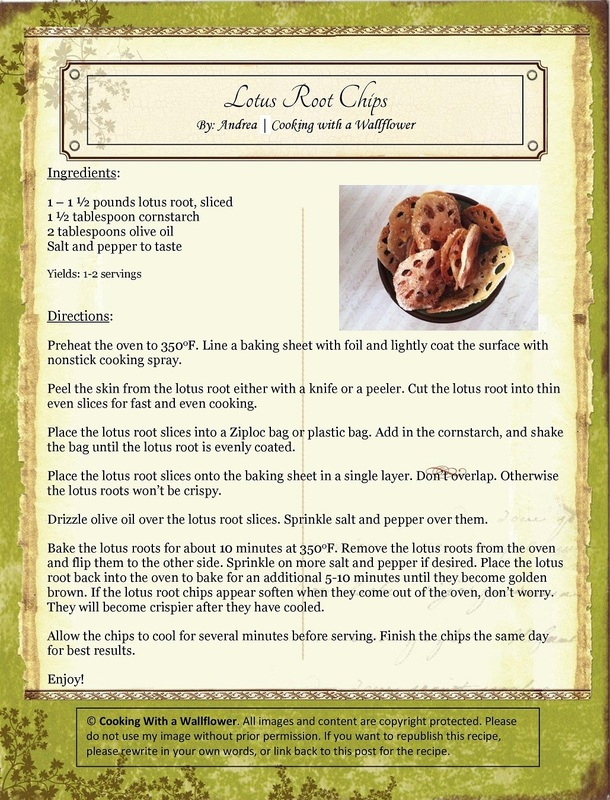 Thanks for the lotus chip recipe! You’re welcome! I love dim sum and can’t imagine not having easy access to it! This is super interesting! How’s the taste? I think I had lotus root a few times when I lived in Japan, and I thiiiink the taste was pretty mild, but I’m interested as to how chip-ifying them changes that. Can’t wait to try them though! Never heard of these before. Anyone know what they taste like? Looks yummy! These look amazing! I’m living in Singapore, so I really have no excuse not to try to make these! I love lotus chips and now I’m back in Australia I can make some! I had it raw in a Japanese donburi bowl the other day, it tasted weird fresh sort of like a raw turnip or something, what does it take like fried as chips? 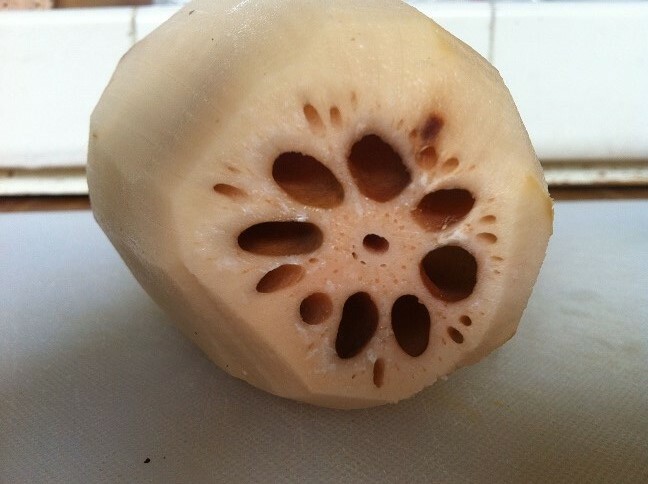 I have never had lotus root raw. I didn’t even know we could. I usually have it as a soup. But after it’s been turned into a chip, it’s very crunchy. 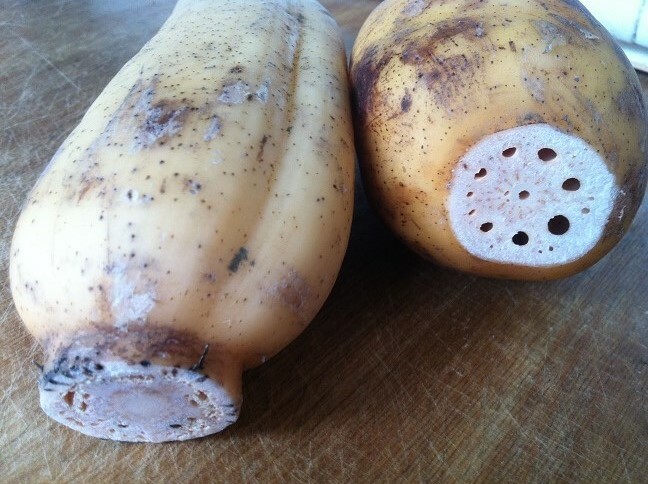 The lotus root is naturally slightly sweet so you can taste a little of that too. I really hope I can find this interesting root. These look really good, will have to give them a try! 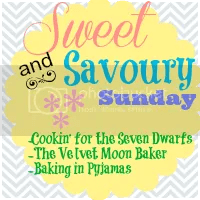 Sounds yummy, and you bake them too – even better. Cool! That looks so nice and crunchy! Oh i LOVE Shanghai Dumplings. 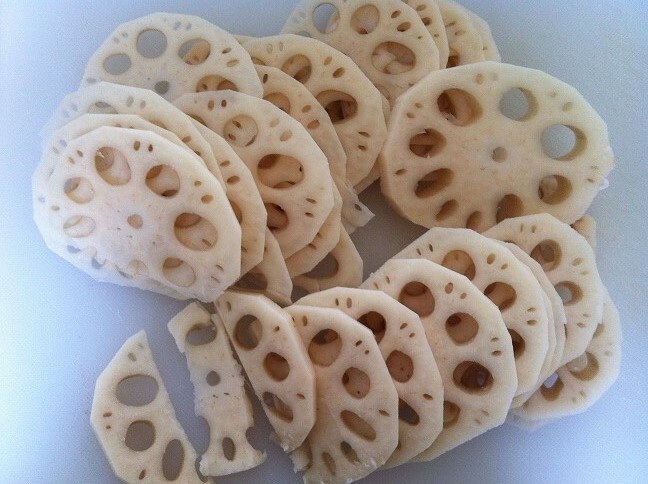 Lotus root always looks so exotic. Your chips look exotic and delicious. Looks yumm, can’t wait to try!! I never knew that you can turn the root into crunchy chips like this. This will definitely taste so good!! It’s eaten here in India in various forms! Dried version with potato and spices, it’s delicious. Dried or fried vege are so popular in Japan ! Lotus is my favorite and your dish looks so good ! !